Canadian Web Hosting Review 2019: Is Canadian Web Hosting a Good Hosting? Canadian Web Hosting offers shared, VPS, and dedicated server hosting services to a worldwide pool of clients at great prices. With a 60-day money back guarantee and 99.99% uptime, they stand as an attractive hosting option for bloggers and small business owners with high traffic demands. Established in 1998, Canadian Web Hosting has over 18,000 clients from all over the world and stands as one of the leading hosting agencies in their country. They are SOC 2 Type II compliant, which is good news for businesses working towards SSAE 16 certification requirements. Their data centers are located in Toronto and Vancouver with maintenance and support teams working on-site 24/7. Canadian Web Hosting offers three broad types of services. There are shared hosting plans for beginners just starting out with creating a website. Their scalable cloud servers & VPS hosting offers are ideal for business owners and developers anticipating growth. Their dedicated servers, for the more demanding customers, offer third-party app installations and free hardware replacement. Additionally, they have a 99.9% uptime guarantee, with the promise of credit in the event that they fail to honor the guarantee. All of these plans offer the choice between Windows and Linux-based servers. Most hosting agencies offer this, so it’s pretty much a standard option. The choice matters mostly to advanced clients with specific needs. For all other intents and purposes, the standard Linux OS will work perfectly. All shared hosting plans offer up to 10 GB of backup storage space, though you’ll have to perform these backups manually. Alternatively, if you’d like them to take care of the backups for you, they do have a specialized storage and backup service that performs near-continuous backups. Canadian Web Hosting also offers VPS and dedicated server options. Their entry-level VPS hosting plan starts you out with 512MB memory, one CPU core, 20GB of storage, one IP address, and 1TB of bandwidth. There’s also a high-performance VPS option utilizing SSD storage and far more processors, with memory between 16 and 64GB and bandwidth starting from 6TB. Enterprise-grade customers also have the option of going for Canadian Web Hosting’s dedicated server packages. These dedicated servers are fully customizable and can either be self-managed, partially managed, or fully managed. The registration process is seamless: all you have to do is create a username and password, and then provide some basic information. The dashboard is easy to use, although at times a pop-up chat window with someone from support could be helpful for less technically-experienced users. Canadian Web Hosting’s plans aren’t the cheapest, considering the features and resources included in each plan. However, they do offer far greater data security and privacy compared to U.S. web hosting companies, given that all their servers are located in Canada and thus protected by the country’s more secure regulations. 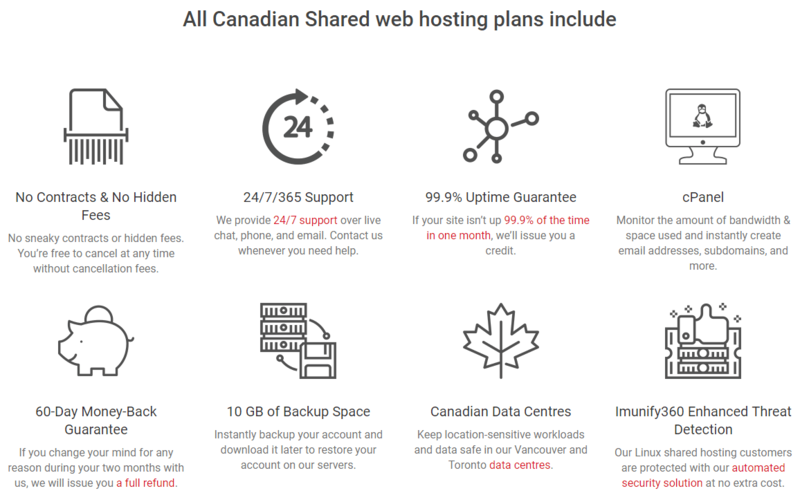 Also, Canadian Web Hosting offers a 60-day money back guarantee with most of their plans (obviously, this policy doesn’t apply to enterprise-grade solutions like dedicated servers). This is twice as long as the industry standard, which was a good vote of confidence for their quality of customer service. They don’t have a free plan or trial available, unfortunately, but like many web hosts they do offer discounts for longer contract terms. One perk about Canadian Web Hosting is that they offer quite a number of payment methods. You can choose between credit card, PayPal, INTERAC email transfer, wire transfer, or check. If their knowledge base and FAQ doesn’t quickly resolve any issues that come up, you’ll be glad to know that there’s 24/7 phone support available, as well as a ticketing system with a promise to respond to all tickets within 24 hours. They’ve also implemented a live chat with multiple support agents on hand at all times. Canadian Web Hosting has a versatile offering of shared, cloud, VPS, and dedicated server packages, catering to businesses of all sizes. Though they aren’t the most affordable, their high service standards and increased security, data protection, and privacy may prove invaluable for security-conscious organizations. Wondering how Canadian Web Hosting stacks up against other Web Hosting companies? Enter any other Web Hosting company and we will give you a side-by-side comparison.